Where is Occupy Wall Street on Extended Unemployment? 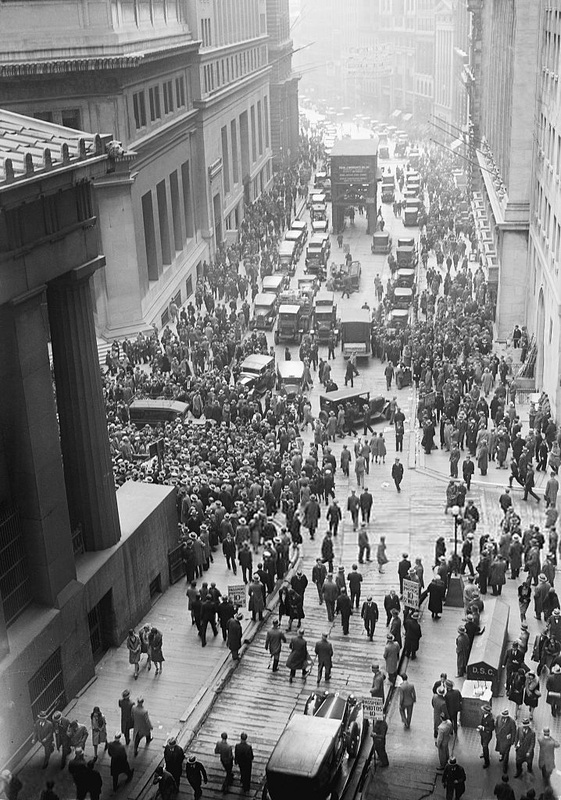 Crowds gather outside the Stock Exchange after the crash of 1929. The prior year, the 1% had achieved a huge proportion of total income and wealth in the US, a number that wouldn’t be approached again until… now. From Wikipedia commons. My ire was stirred a week or so ago by an article in Huff Post about the end of long-term unemployment benefits. For those of you joining late, the Congress left town in December for the Holiday recess without renewing extended unemployment benefits, which expired on December 28. The article itself was pretty straightforward. They interviewed a 50 something and a 60 something about their prospects for re-employment. But the blogger reactions to these two men (and the vitriol engaged against those who are jobless) were pretty nasty. There seemed to be no comprehension of the fact that there are some three applicants for every job. I had posted a few weeks ago about my past (short) history as an IT recruiter. I’ll spare you the details (because they’re here), but in my experience, advertised jobs (even full-fledged job requisitions issued by companies) are not proof that there are jobs. A company might be looking around to get an idea of who’s available for an expansion or a new business line. Or the job might be real, but the company is in no hurry to fill it (or sometimes the department head wants it, but the director of ops is saying “let’s see if there’s still high demand next quarter”). There are also, amazingly, ads all over for unpaid internships. This is true even on the New York State jobline, which is all about sorting NY jobs for the unemployed. Back to the end of extended unemployment–it looks like neither party is making renewal of benefits a priority. Throwing people on long-term unemployment under the bus is not going to bring back employment or fix the deficit. What will bring back employment is working people having enough disposable income to buy things. Wages for the 99% have been flat or declining for more than a decade. As I pointed out a week ago, we’ve passed a Rubicon on employment stats. We have the lowest rate of working-age adults in jobs since 1978. There’s no comparing current figures to years prior to 1978, because 1978 was the year married women with children started taking full-time jobs outside the home. Prior to 1978, most families could do just fine on what a single wage-earner brought home. As Elizabeth Warren pointed out in this speech, the problem of the ‘aughts’–the issue that put the middle class on life support in 2007 (before the meltdown)– is that a family needs AT LEAST 104 weekly full-time paychecks a year to do what 52 could do in 1977. And yet, the Sunday 1/19 front page from Huffington Post pointed out that none of the Marquee Sunday news shows have even mentioned continuing high unemployment or the end of extended benefits. Why not? Is it boring? It isn’t boring for the millions of families who’ve been living in straitened circumstances since 2008. And (to its credit) Huffington Post has continued to report on unemployment, even as most MSM has ignored it. And the protest movements I’m aware of have also ignored the unemployment issue of the last year. I have been a supporter of the Occupy Movement since October of 2011, and I take to heart the Declaration of The Occupation of New York City written back in 2011. But there has mostly been silence on unemployment for the past year or so, even as numbers considered unthinkable in 2008 have coagulated into the status quo (many of the jobs created last year were part-time positions, and that wasn’t just about the Obamacare mandates). I’ve been following protests that Occupy Wall Street has organized over the past year (I’ve even been at some of the organizing meetings). The last half year of protests have been about Bill DeBlasio, the incoming mayor of New York, and his selection of Bill Bratton as chief of police (who did liberals expect DeBlasio to appoint? Ray Occupy Lewis?). There have been protests about fracking and the natural gas pipelines being built under the city. Occupy has taken part in protests on behalf of people with AIDS. These are all important causes, but they’re also traditional lefty causes that other groups would be participating in. You can’t fix low wages or Citizens United or police misconduct/brutality or civil rights without making fundamental changes to corporate power. And the 1.3 MILLION unemployed (and their family members) who were just kicked under the bus by the end of extended benefits probably aren’t that interested in protesting Bill Bratton. If they’re up for protest, they’d like to protest the plutocrats who sent millions of middle-class jobs overseas. They’d like to get some money to pay their bills. They’d like to have a snowball’s chance of getting a job that pays above minimum wage. They’d like somebody to acknowledge that inflation is bubbling along under the radar in food and rents and property taxes. People who know me understand that I shouldn’t be organizing anything (I am the simple artist–I sing, I play the monologue). But I’m calling for people to help me plan something whereby Occupy addresses continuing unemployment. I can understand those in Occupy who think that the whole capitalist system has to come down, and finding ‘jobs’ at this point is shoveling against the tide. And the neo-Marxists in the movement are going to argue that a return of employment will still put money in the hands of the 1%. I have also blogged about the possibility that (thanks to advances in automation coupled with aggressive off-shoring of jobs) we are not going to get back to ‘normal’ unemployment rates of 5%. If our ‘real’ unemployment rate is going to be in the double-digits, politicians need to make a plan B for what we’re going to do with millions of people who might never work again. As the Declaration of the Occupation made clear, the drivers for ignoring unemployment are the corporate oligarchs and their PACs. The 1% of the 1% have things just the way they want them–high US unemployment keeping wages stagnant, a government that (thanks to Citizens United) can be bought more easily than ever before, low inflation rates and non-existent rates of returns on savings (which force people back into the Wall Street casino). As I pointed out in on 1/18 in my presentation for overturning Citizens United, the system wasn’t so great before Citizens United. How are those ‘high paid congresscreatures’ (making upwards of $174K a year not including a few extra dollars for chairmanships) going to supervise the banksters? Jamie Dimon of JP Morgan Chase made over 100 times what a congressman makes in a year, and that’s before considering the multi-million golden parachute waiting for him when he tires of going to the office. On his Christmas card, he’s playing tennis with his family in his huge living room, apparently taking a chance on wrecking an original Jackson Pollock painting. Some mere congressman or Senator isn’t going to be able to crack down on people who can treat a multi-million dollar painting in such a cavalier manner. If you think this is a worthwhile project, drop a comment below or throw something up on Facebook. But I’m tired of yelling at mere politicians for carrying out the wishes of the plutocrats. Yelling at politicians about change is like punching a ventriloquist’s dummy for insulting your wife.